South Main: Fort Worth site being redeveloped for restaurant, office - Near Southside, Inc. 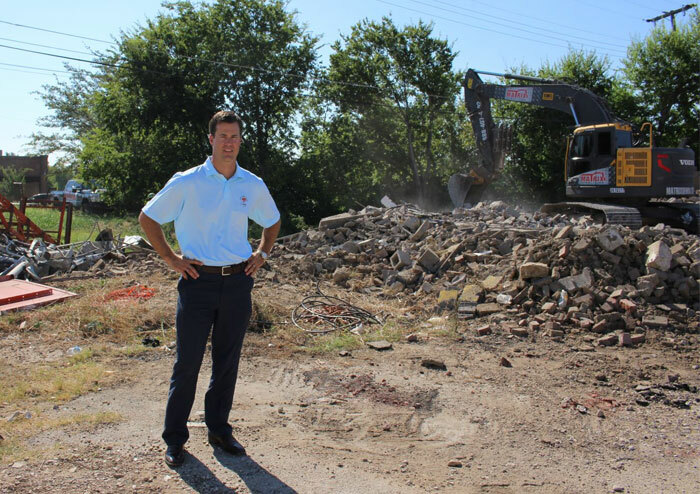 Developer Dak Hatfield is redeveloping the site at the southeast corner of South Main and Dashwood, a block north of Rosedale Street, taking down one building and planning to build a total 9,500 square feet. His plans call for first-floor restaurants and second-floor office. Hatfield began demolition within the last few weeks. “We are looking at being finished in Spring ’17 if not before,” he said. Real estate activity in the South Main corridor, south of downtown, continues to pick up steam as the city nears completion of a reconstruction of the street. Activity farther north of the site, including ongoing construction of the University of Texas Southwestern Monty and Tex Moncrief Medical Center at Fort Worth at Pennsylvania Avenue and South Main, and a major multifamily project under construction at that intersection, shows the appeal of South Main, Hatfield said. “It just shows we have a lot of demand for business in this area,” he said. Hatfield, whose other projects include teaming with partners to remake the Supreme Golf warehouse and Magnolia-May mixed-use spaces on the Near Southside, has a few other projects going on around the one at South Main and Dashwood. One block to the east, he recently completed the renovation and conversion of a building at 1001 Bryan Ave., leasing it to the Pouring Glory restaurant and growler fill station. And at 916 Bryan, he and partner Andrew Blake have been bringing back a 1945-vintage building, putting office tenants on the first floor and nearing completion later this year on the second floor.